Not many troops can boast visiting nearly a dozen countries on three continents during one, two-day campout, but the Troop 50 Scouts and leaders who visited the campus of Servants in Faith and Technology (SIFAT) in Lineville, Ala., can! SIFAT is nonprofit Christian organization that provides training in community development and self-help skills for basic human needs — including the physical, spiritual, social, and economic — in hard places in our world. It raises awareness of needs and global issues, providing opportunities for people to get involved personally, both to learn from and to serve alongside those with scarce resources. Since its founding in 1979, SIFAT has trained church and community leaders from more than 80 countries. The organization has helped thousands of North Americans leave their comfort zone, cross into other cultures and social strata, and become one in Christ. as they start the course. Upon arrival at the SIFAT campus, Scouts spent time prior to the start of their cultural immersion experience sharpening their orienting skills. Since this was the first campout where our newly formed patrols — the Outdoorsmen Patrol and the Carnivorous Panda Patrol — had the opportunity to work together. Patrols created their own compass courses for the other to complete after measuring their standard number of paces for 100 feet. Once the patrols completed the compass course created by the other patrol, they broke up into two-Scout teams to complete, with minimal assistance from adult and youth leaders, a compass course laid out by Scoutmaster Andrew Baird and Assistant Scoutmaster Billy Lytle. While each team came within "spitting distance" of the course's end point, the Carnivorous Pandas' team of Michael and Aiden was closest to the mark. However, when each patrol's teams' distances to the end point were combined, the Outdoorsmen Patrol was the overall winner. The troop then transitioned to its SIFAT international immersion experience. This experience included traveling to and living in a simulated, rural Global Village where they participated in interactive programs that simulated the life and activities of the people indigenous to the countries represented on the SIFAT campus. After paring down their personal supplies to a sleeping bag and other necessities that would fit only in a burlap bag, the troop, with the guidance of its SIFAT staff facilitator Becca, traversed great distances and a perilous log and cable river crossing to their overnight home. SIFAT's simulated urban slum city. Scouts visited replica living accommodations representing countries such as Uganda, Liberia, the Philippines, Nepal, Bolivia and Nigeria. The troop was divided into thirds and spent the night in structures from three of these countries, thereby experiencing the dirt floors, scant furnishings, and the drafty and cramped quarters those native to these countries experience every day. They learned the plight of one-seventh of the world's population who live in urban slums by walking through SIFAT's simulated slum city. and Uganda (top right), and leaders stayed in Liberia (bottom right). The Global Village experience centers on, as SIFAT founder Sarah Corson wrote, "When we walk in their shoes and feel what they are feeling, reasons for poverty become much clearer. Then we begin to understand the Biblical teachings on our responsibility in the face of poverty and need." The Global Village experience strives to educate SIFAT visitors and challenge them to take what they have learned and respond in their local communities with action, as well as a greater appreciation for the blessings they have and for which they tend to take for granted, and the hardships experienced by their brothers and sisters throughout the world. The troop also learned about "appropriate technologies" — the various tools, equipment, and processes that meet basic life needs that can be easily replicated using resources readily available in these countries. One such "technology" included mud-based cooking apparatuses called "rocket stoves," which Scouts and leaders used to prepare their Saturday-evening dinner and Sunday-morning breakfast. Saturday's dinner consisted of a two-pot meal that included rice and SIFAT-grown sweet potatoes, as well as onions freshly harvested from the SIFAT gardens by several of the Scouts. On Sunday, Scouts prepared a breakfast of ugali — an African dish similar to grits and made from ground corn (which several of the Scouts ground themselves). 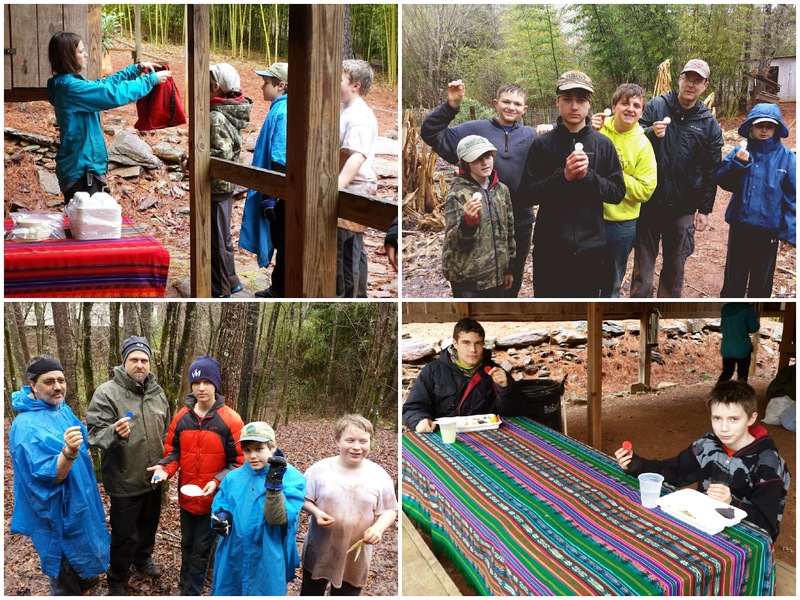 In both situations, Scouts and leaders learned the challenges of adapting to this new "technology," the need to work together as a "family," and reality of limited quantities of food available to many throughout the world. As part of the immersion experience, and in accord with the troop's servant leadership mission, the Scouts and leaders provided service to SIFAT Sunday morning by assisting with its gardening program. The troop, with the help of SIFAT staff, gathered a truckload of leaves that could be added to the facility's composting program. SIFAT hosts a garden with a full array of seasonal vegetables that are grown to feed full-time resident staff as well as the various groups like Troop 50 that visit the facility. The troop spent about an hour gathering and loading leaves for transport to the SIFAT gardening area for composting. (bottom right) the "have too muchs"
As part of an evening devotion Saturday and two devotions on Sunday, the troop also learned how pervasive hunger is in the world. As much as 35 percent of the world's population are "food insecure" — meaning they have some access to food, but not the quantity or regular reliability necessary to always have enough to eat — and 50 percent that frequently goes without the amount of food required to avoid malnutrition or starvation. To emphasize that point, the lunch "feast" everyone looked forward to quickly turned into a lesson of "haves" and "have nots." Scouts and leaders selected color chips (photo, top left) that placed them into one of these three categories: white chips forming the largest, malnourished group (photo, top right); blue chips, the food insecure (photo, bottom left); and red (photo, bottom right), those who enjoy an excess in available food. As red chips feasted on a meal served by SIFAT staff, blue chips nibbled on their one corn tortilla while white chips looked on with grumbling, empty stomachs. Thankfully, being just an exercise, everyone eventually enjoyed in the feast after the troop discussed how the simulation made each Scout and leader feel and how the activity reinforced what the troop learned during its near-24-hour experience. At the troop's monthly Patrol Leaders' Council, the troop's youth leaders gave the campout high marks to learning about cultures and ways of living in developing countries; using new "appropriate technologies" such as rocket stoves; getting to be adventurous on the SIFAT creek crossing and rope bridge; learning and trying new things; and sharpening our compass-use skills. The youth leadership hoped to see greater attention at future events to everyone's ability to listen better to instructions, be responsible for their personal belongings, and be productive during activities such as meal prep. For more photos from the troop's SIFAT outing, visit the troop's online photo album.